If there is not a crack in the slab with water coming into the building, this leak will be hard to locate. There are several methods of looking for the leak. Ultrasound leak detectors can listen for the water leaking but is very time-consuming to run the tool over the entire slab. 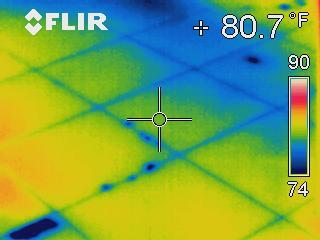 With the correct circumstances, the infrared camera can quickly look over the entire concrete slab and detect where the water leak is starting from. If the slab is outside, it cannot be wet and must be warmed up by the sun. This is called solar loading of the concrete. If the slab is inside the building, the area will need to be warmed up to 10 to 20 degrees above the ground temperature. 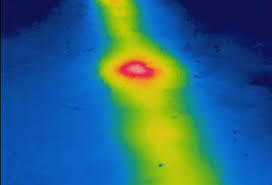 In the Willamette Valley the ground temperature is approximately 55 degrees. This means the room where the leak is suspected should be 65 to 75 degrees. The warmer the better. The water leak under the cement will tend to cool the slab where it is wet through a process called conduction. The more water the better the conduction. Using this principle we are able to see the cooler area of the concrete slab and thus locating the likely place where the water leak starts.